VADCON is a manufacturer and distributor of video, audio, and data connectivity products. 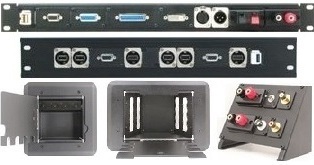 wired enclosures, cables, connectors, adapters, rack accessories, and more. For custom products, Vadcon can take your concept from design to production. Vadcon offers a large selection of blank, pre-punched and pre-loaded 19” rack mount patch panels from 1RU to 7RU with various connector options and port densities. If our Adapter Plate or Modular Advantage solutions will not work for you our custom department and metal shop can bring your custom requirements from concept to a finished product. 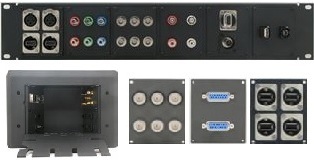 Build your own custom Patch Panel, Wall Plate, Floor Box, or Interface Assembly! Vadcon’s Interchangeable Adapter Plate solution offers a quick solution for custom configurations. Vadcon’s Modular Advantage patch panels, wall plates, and floor boxes offer a quick turnaround for custom configurations. The module plates are easily interchanged making upgrades or updates quick and easy. Vadcon’s wall plates feature 16” on center mounting holes for stud mounting. Our wall plates are a perfect fit for your studio or wall mount needs. Vadcon offers a large selection of pre-punched and pre-loaded stainless steel face plates for standard gang box mounting. Custom Face Plates available! Floor Boxes - Floor Pockets - Stage Pockets - Stage Boxes. Vadcon offers a large selection, available loaded or unloaded. Our heavy duty floor boxes can be configured for your installation. Available in two depths - 4.25" or 8.25". Our stock enclosures are wired front to rear/rear to front. Custom configurations and wiring are available. Recessed Dish Plates for wherever recessed connectors are needed. Speaker cabinets, walls, road cases, and more! Available loaded or unloaded. Many connector choices are available. Rack Screws - Rack Rails - Cable Management - Solid Rack Shelves - Vented Rack Shelves - Sliding Rack Shelves - Rack Drawers - Rack Ear Extenders - Hinged Wall Brackets - Wall Brackets & More! Vadcon stocks a large selection of connectors and adapters for audio, video, data, and RF. Examples include BNC, XLR, RCA, F, SVHS, PAL, N, SMA, TNC, UHF, FME, 1/4" TS, 1/4" TRS, Twinax, Mini UHF, 3.5mm, D-Sub, Pal, USB, Gender Changers, HDMI, Firewire, Toslink, and more! Audio Cables - Video Cables - Data Cables - RF Cables - Panel Mount Cables - Custom Cables. BNC, XLR, RCA, F, SVHS, 1/4", 3.5mm, USB, Firewire, Toslink, and more! Large selection of Dust Caps, Colored Washers, Hole Plugs, Bushings, Gaskets, Labels and more! Rack Screws, Jack Screws, Hex Nuts and Machine Screws! Vadcon stocks many sizes and shapes of Microphone Flags to choose from. 4 Sided Square - 4 Sided Rectangle - 4 Sided Round - 3 Sided Rectangle - 3 Sided Squares. Purchase Blank Mic Flags to apply your own logo or purchase Custom Mic Flags and we'll apply your logo. Over 140 Designed DVD & VHS Cases. Pre-Designed video cases to protect and share your special events & memories captured on video. Titles: Our Wedding, Our Wedding Day, Our Children's Wedding, Our Anniversary, Our Engagement, In Memory, Retirement, Graduation, Cheerleading, My Sweet Sixteen, Dance, New Baby, Happy Birthday, & many more!